Are you a good parent? Are you proud of your parenting? Would you like to take part in a TV social experiment for a major UK broadcaster? TV company Monkey Kingdom are currently casting parents for a brand new TV social experiment for a major UK broadcaster. They are currently casting for the show and are touring WALES this month to meet with applicants. If you are confident in your parenting technique, proud of the way you raise your children and have a particular parenting strategy, Monkey Kingdom would love to hear from you. 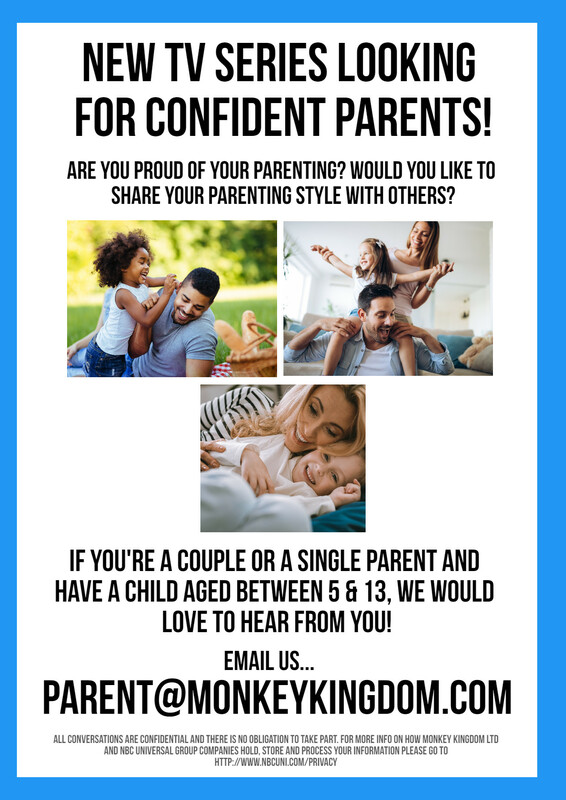 Whether you’re in a couple or a single parent, Monkey Kingdom are looking for parents who would like to share their approach with others. Parent(s) will need to have at least one child between the ages of five and thirteen. Monkey Kingdom are the creators and producers of shows including Made In Chelsea, The Real Housewives brand, Honey, I Suckle the Kids, Raised by the Hand of God and E!’s new dating reality show, The Bi Life. If anyone would like to apply or would like to find out more information about the show, please send your name, contact details and why your parenting style is so great, to parent@monkeykingdom.com.